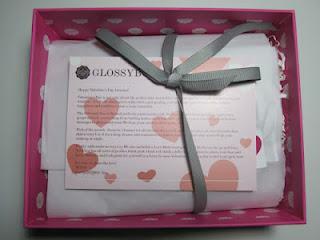 A few weeks ago, I took advantage of the Groupon Glossybox deal. 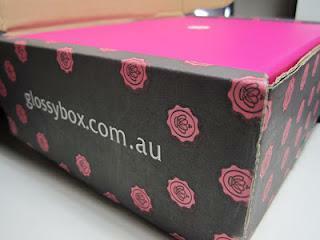 I was soo excited when I received an email yesterday saying my box was shipped, it arrived this afternoon! 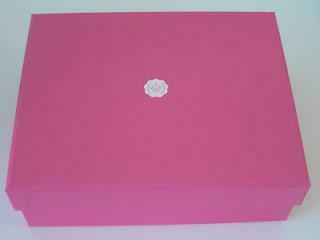 I must say this Valentines edition is very girly looking! 1. Bobbi Brown - Lash Glamour Extreme Lengthening Mascara : This mascara helps make your lashes ultra-long and separated. The bristles inter-lock with lashes like a zipper, so individual lashes are coated. Good sample size! 2. Jane Iredale - Tantasia Self Tanner : Fool them all with a golden bronze, natural-looking tanned face and body from this moisturising self-tanner. The size of this sample was quite small and I don't do self tanning, probably give it to my sister. 3. 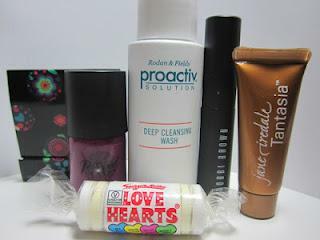 Proactive - Deep Cleansing Wash : Use this product to clear up skin when it's acting up or for a deep cleanse. Size of this was good! 4. Star and Rose - Floral Wonderland Emergency Nail Files : Pocket this cushioned nail file for all those nail emergencies and on-the-go fix ups. 5. Polished London - Nail Enamel : Dries fast and long lasting. Will definitely give this a go, love purple! !